Now that Addy is three years old, she is starting to say things like “I do it myself!” It’s not an easy thing to STOP doing things for your toddler. I want to pick her up and help her go to the “big girl potty”, to brush her teeth, and to wash her hands. She has ideas of her own. Life sure does pass you by in an instant, and with her being my last, I had to make things a little easier for her. 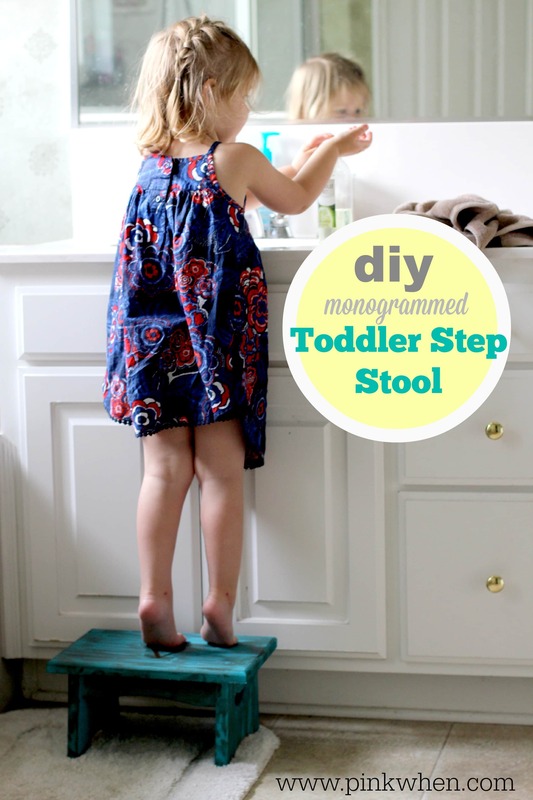 I decided to let her “do it herself” by giving her something every little person needs – a DIY Toddler Step Stool. Now, I know I could have gone to the store and purchased some cute and cheap little plastic stool. It would have made sense, and it would have worked just fine. However, this is my last little one. I will never have a child go through this stage again. I had to make it special. I had to do it myself. This is awesome. Scarlet is nearly five but very petite and our sink is very high up. And we have a stepstool with puzzle letters that Des always takes off and then Scarlet can’t stand in the holes left! My husband made both of our girls stools when they were two. Fast forward many years and they each have theirs in the apartment they share. They sit on the stools each morning to put on their makeup. They are 28 & 26.